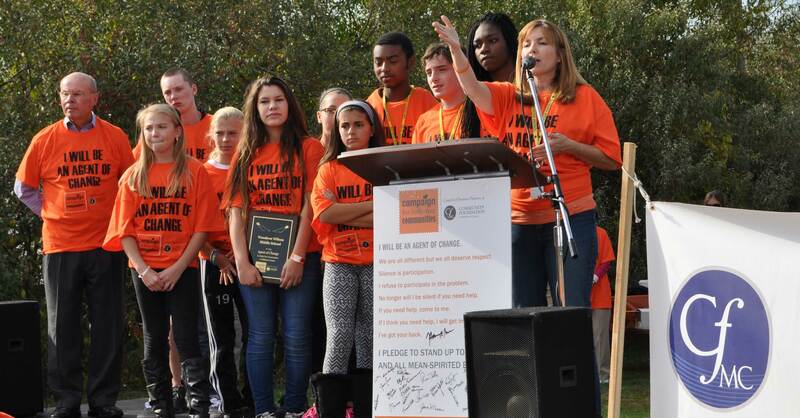 Over 300 participate in Campaign for Bully-Free Communities Rally; Chester Elementary School and Woodrow Wilson Middle School in Middletown receive $500 Grants. 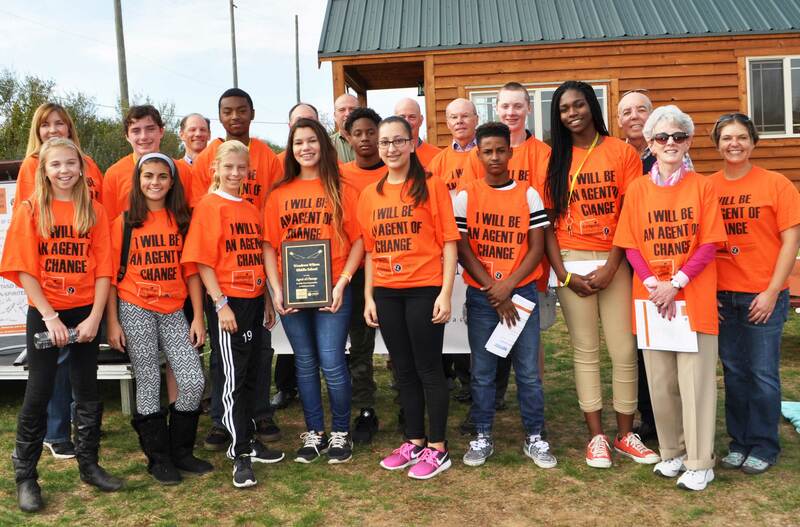 Middlesex County students, educators, business owners and civic leaders came out in numbers to rally for bully-free communities at the Empower Leadership Sports Center in Middletown on October 21, in recognition of Unity Day and National Bullying Prevention Awareness Month. 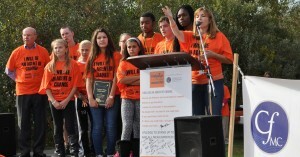 Organized by the Community Foundation of Middlesex County (CFMC) and its Council of Business Partners, the Campaign for Bully-Free Communities Rally included team building activities, guest speakers and the presentation of the inaugural Bully-Free Communities Spotlight Award before a crowd of an estimated 300 people. Awards, with a grant of $500 each, were presented to Chester Elementary School, located in the town of Chester, and Woodrow Wilson Middle School located in Middletown. Campaign spokesperson and former UCONN/NBA basketball star Donny Marshall was also recognized for his individual contribution and dedication to the cause. 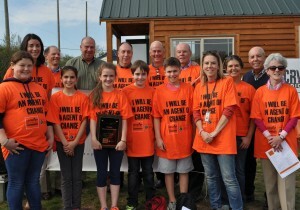 The Campaign for Bully-Free Communities: In 2009, when, working through the Community Foundation of Middlesex County, the Council of Business Partners Fund was established and with the help of Rushford, a Hartford Healthcare Partner, the “No Bully Zone” program was developed and funded. 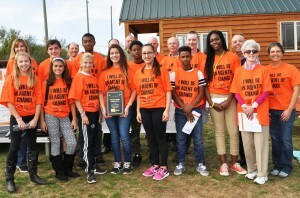 Council members contribute annually and, to date, the partnership has implemented the No Bully Zone Program in Keigwin Middle and Woodrow Wilson Middle schools in Middletown; in the Haddam-Killingworth school district; in Oddfellows Playhouse and Ivoryton Playhouse projects; The Country School; and in conjunction with The First Tee of Connecticut youth programs. 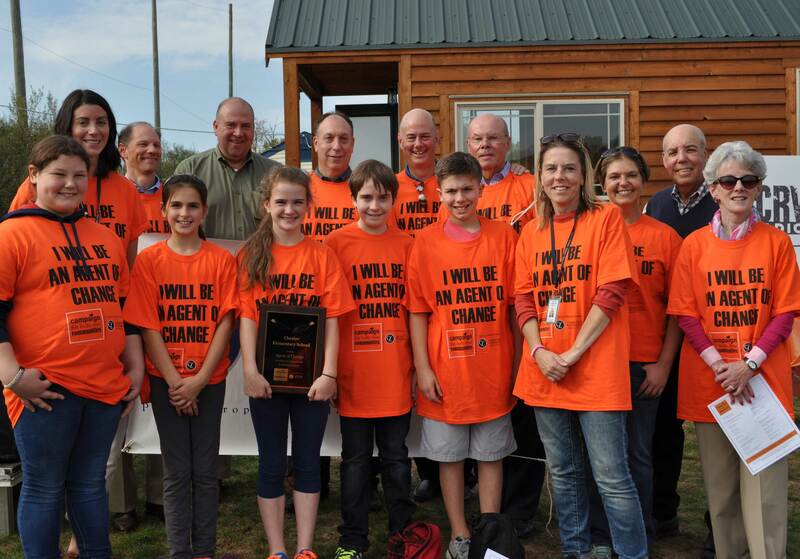 Most recently, the program was adapted for school bus travel on buses operated by M&J Bus Inc. with 470 drivers receiving training this year, and is also being implemented in the East Hampton school system with support from the Shulman Family Fund and the East Hampton Rotary Club. To expand their reach and impact, the CFMC Council of Business Partners joined forces with the Connecticut Association of Schools (CAS); EMPOWER Leadership Sports; The First Tee of Connecticut; LiveKind; Rushford, A Hartford Healthcare Partner; iCRV Radio; Donny Marshall; and Elizabeth Shulman (LMFT) in creating the Campaign for Bully-Free Communities in 2014. The Community Foundation of Middlesex County (CT) is a nonprofit organization dedicated to improving the quality of life in Middlesex County. Its two-fold mission is: (1) to work with charitably-minded individuals and organizations to build permanent endowments and other charitable giving funds; and (2) to support local nonprofit organizations through effective grant making and multiple programs to address community needs. Since its founding in 1997, the Community Foundation has invested more than $4 million through 1,295 grants in support of the arts, cultural and heritage programs, educational activities, environmental improvements, and for health and human services.